The Wisconsin housing market continued its slow and steady upward growth in 2018, with some of the highest trends seen since 2007. Today, we are looking back at the 2018 housing market to help in setting your business goals this year. Click on the infographic to enlarge, and find even more details below. Wisconsin saw a significant spike in home sales in 2018. Housing demand remained at a record high for single-family homes and condominiums, making last year the third highest on record since 2007. The number of building permits requested and obtained in Wisconsin in 2018 grew modestly over the previous year. This trend carried across the Midwest as the demand for new homes prompted more construction projects. The median price of a home in Wisconsin continued to increase in 2018 with consumer demand and a deepening inventory shortage. 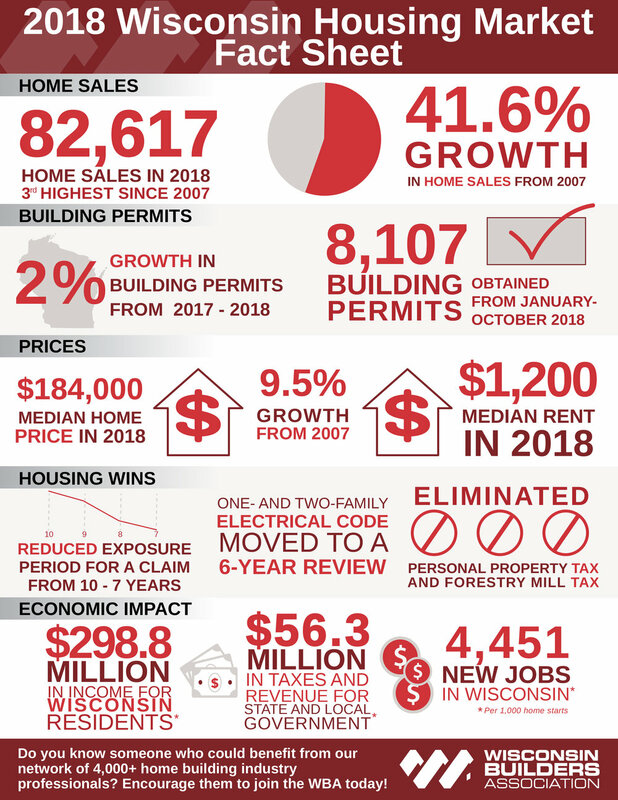 The Wisconsin housing market has had a notable impact on the state’s economy, according to the NAHB Economic Impact of Home Building in Wisconsin report. The data shows that the Wisconsin housing market is continuing to bounce back, helping to boost confidence among builders and affiliates as they plan for the year ahead. Do you know someone who could benefit from our network of 4,000+ home building industry professionals? Encourage them to join the WBA today!